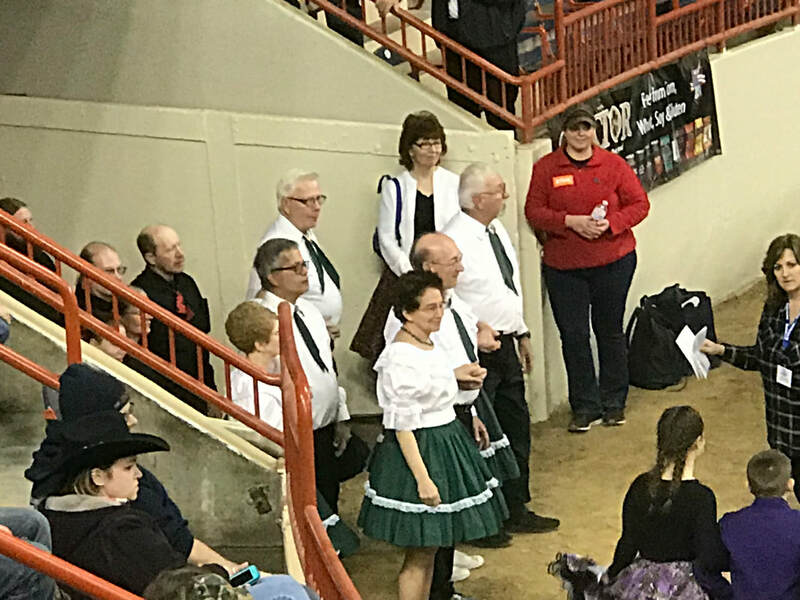 ​The display and selling of second hand square dance attire was prevalent during the April 5th Stop & Sell The Roses dance. The dance floor was crowded with six squares of club members and guest visitors. Pictured above is FCP Club President Henry Lane with the guests from the Village Swingers club in Rockville, MD. Seven squares of marchers attended the belated St. Patrick's Day themed March To The Dance Hall Dance on Friday March 22nd. Included in the mix was a contingent of Felonious Four County Squares with the devious purpose of stealing our beloved banner. Pictured on the left is the dancers in their themed green. Pictured on the right is the aforementioned nefarious looters taking the banner from a bewildered Club President Henry Lane. I am pretty sure that a recapture the banner raid is in the astute planning phase of General Henry. On March 15th Promenaders Jan & Alex Dommerich were recognized for their volunteer work for the WASCA festival. The picture above shows members of the club with Jan & Alex displaying their Dancer Appreciation Certificate. It was a Primary Colors theme at the March 6th dance class. The picture shows the class members who wore those colors. 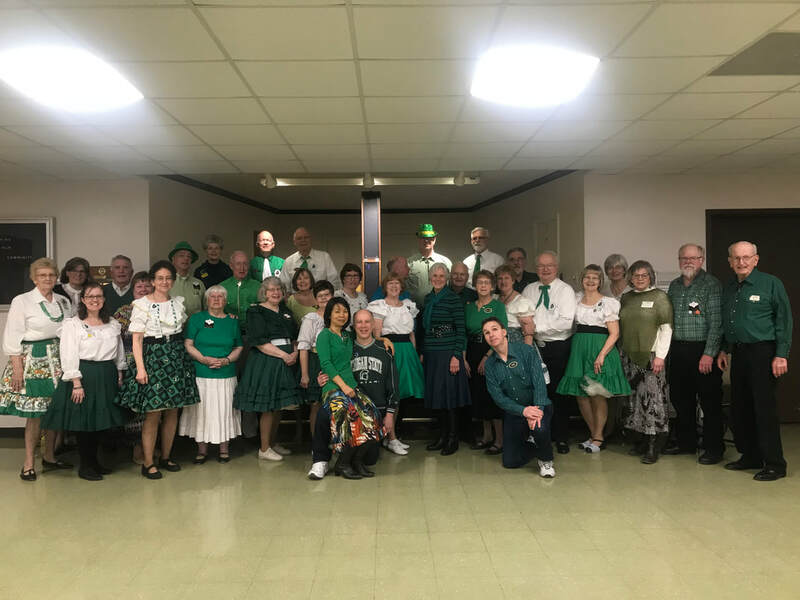 ​Club members, students, and visitors wearing the dots at the Polkas & Polka Dots dance on 3/1/2019. The PLUS semester of the 2018-2019 dance class continued on 2/27 after a snow day off on 2/20. To make up for lost ground, Class Instructor Dan Grimes taught 3 new PLUS calls. They were: Tea Cup Chain, Peel Off, and Linear Cycle. It was a Glitz & Glitter theme at the dance. The picture shows class members donning their appropriate apparel with the gentleman 4th from the left rather ornate. He had a round red flashing signal light attached to his belt on the back. It was SRO (Sitting Room Only) at the 2/13 Wednesday Dance Class as 15 Students and accompanying Angels formed 4 squares at the 3rd PLUS class of the 2018-2019 Program. The class welcomed another new student to the mix. It was College Jersey Night as the class wore their college regalia. One new PLUS call (Load The Boat) was taught by Class Instructor Dan Grimes. 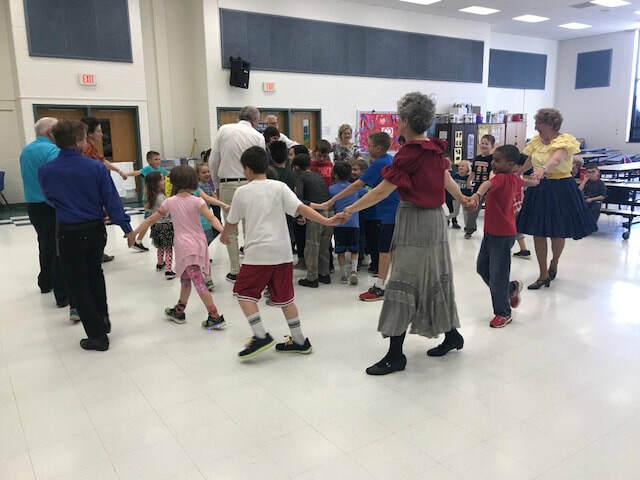 Semester 2 (PLUS) of the 2018-2019 Frederick County Promenaders Square Dance Lessons Program got underway on 1/30 starting with a complete review of all Mainstream calls prior to teaching 30 PLUS calls over the next 14 weeks culminating with a student graduation at the regular club dance on May 17th. The 12 students from the Mainstream session welcome 2 new students to the PLUS session. The theme for 1/30 was Black and White. 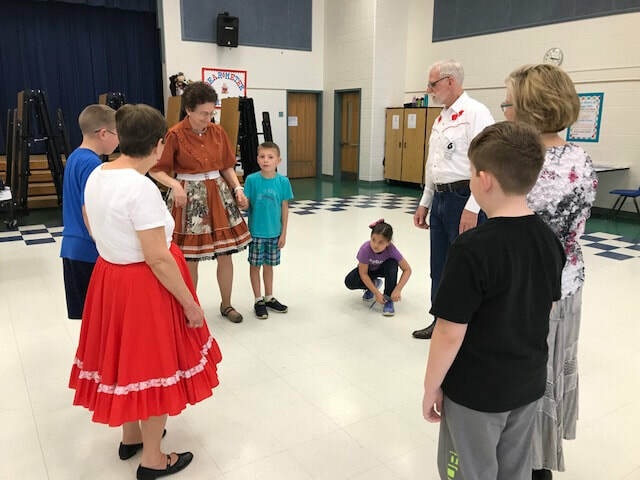 In an unusual twist, Club Instructor Dan Grimes had the students and angels perform a square dance routine in a square of 16. 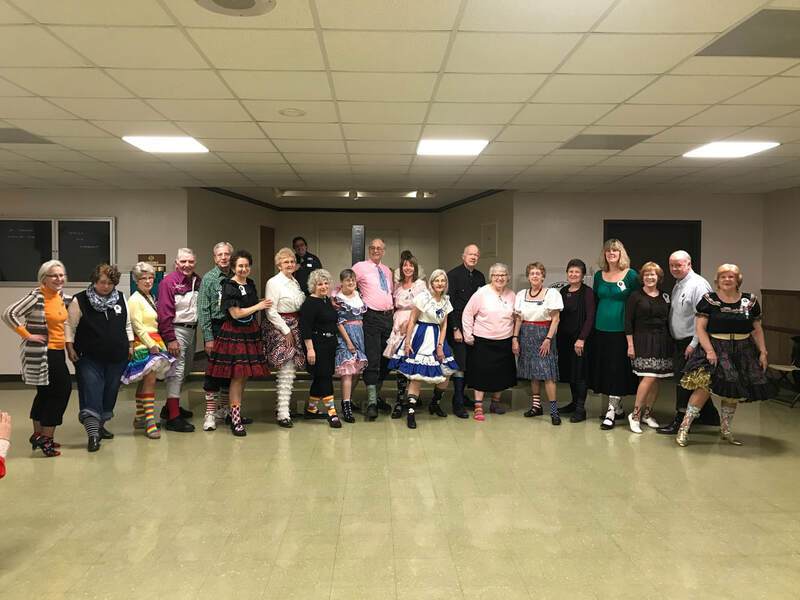 ​Wear something plaid was the theme at the 16th square dance lessons class of the 2018-2019 Square Dance Lessons program on January 23rd. The process of reviewing all previously learned Mainstream calls began tonight and will continue on January 30th in preparation to start the PLUS part of the program on February 6th. ​It was as crazy as you can get, that is from the knees down, at the Crazy Socks dance on January 18th. Pictured above is the cast of characters and their crazy socks. Hooray, Hooray, Hooray, Glory, Glory Hallelujah, It's About Time. These were the terms bandied about after the 15th class of the 2018-2019 Wednesday Nights Square Dance Lessons program. This night marked the completion of the last 4 Mainstream calls by Class Instructor Dan Grimes. To date 60 calls have been taught. It was also "Wear Your Favorite Shirt" night as depicted in the top photo of the participants wearing said items. There are two more weeks of Mainstream review, review, and review, before Semester 2 (PLUS) begins on February 6th..
On Monday January 7th one square of the Gad-Abouts attended and performed in exhibition and competition at the Pennsylvania Farm Show in Harrisburg. Pictured on the above left is the square waiting to enter the Parade of Squares at the beginning of the show. The above right photo is the square assembling in their designated spot 47. The Promenaders attendees were Marjorie Barber and Dan Grimes. Two videos are in the Video Gallery. 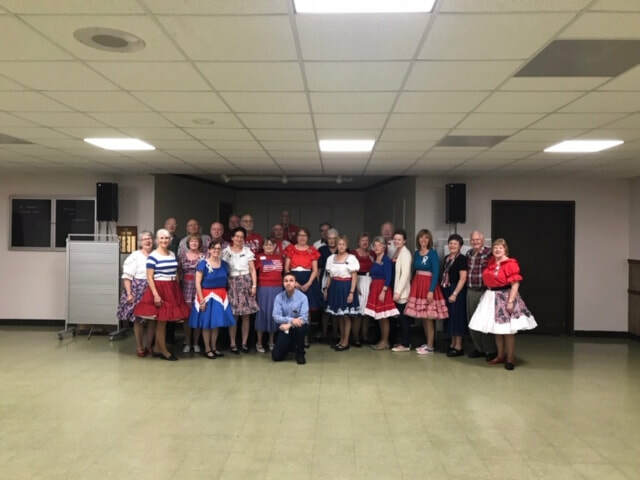 It was Wear Your Stripes night at the 14th Wednesday Dance Class of the 2018-2019 Square Dance Lessons program. Five new calls were added to the growing list of learned Mainstream calls. They are: Tag The Line, Half Tag, Dixie Style To A Wave, Left Swing Thru, and Split Circulate. There are only 2 classes remaining in the Mainstream semester. The PLUS semester begins on February 6th. ​The holiday spirit was alive and well at the 12th dance class on Wednesday 12/19, Four squares (including the 12 students) listened to and danced to holiday singing calls by Club Deputy Caller and Instructor Dan Grimes. Three new calls were added to the ever growing Mainstream regimen. They were: Box The Gnat, Sweep 1/4, and Wrong Way Right and Left Grand. There are only four classes left in Semester 1 of the 2018-2019 FCP Dance Lessons Class. A contest was also held to determine and reward prizes in three holiday regalia categories. The picture on the top left shows Club Deputy Caller Dan Grimes (on the left) with the winners (Most Colorful, Denise McCarthy as the Christmas Genie of the Past, Present and Future, Most Unusual, Pat Marks as the Christmas Elf, and Cutest, Jan and Alex Dommerich as Mr. and Mrs. Santa Claus). Each winner was presented a Christmas glass ball to hang on their tree. The picture on the top right shows all of the Angels and students who donned holiday attire. 12/7/18 CHRISTMAS POT LUCK DINNER DANCE! ​The holiday season was kicked off in a rousing and tasty way at the Christmas Pot Luck Dinner Dance on Friday December 7th at the FCP club dance. 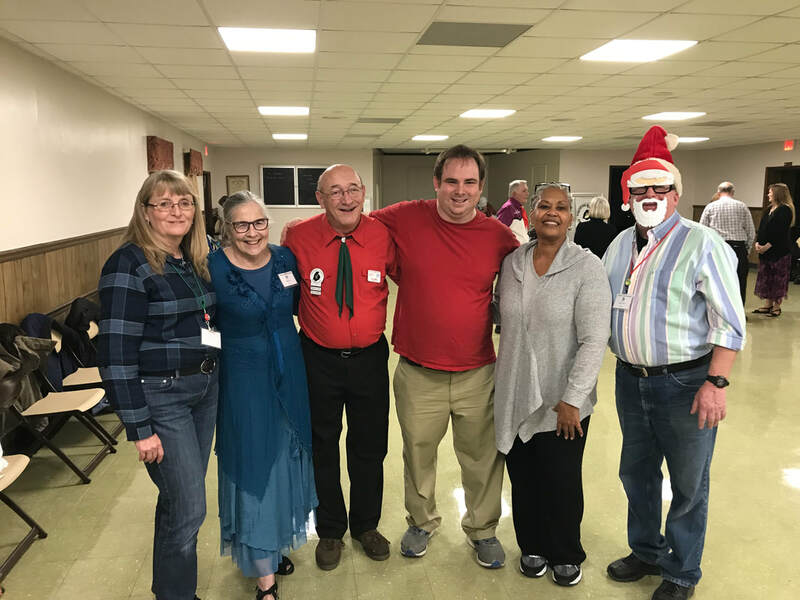 Food and holiday cheers were abundant as five of the dance class students (on right) joined regular club members and guest visitors to the seasonal singing calls of Club Caller Doren McBroom. 11/2/18 thankful for veterans dance! Patriotic colors are plentiful at the 11/2/18 Thankful For Veterans Dance. Spooky things were going on at the 6th Wednesday Dance Class on 10/31. 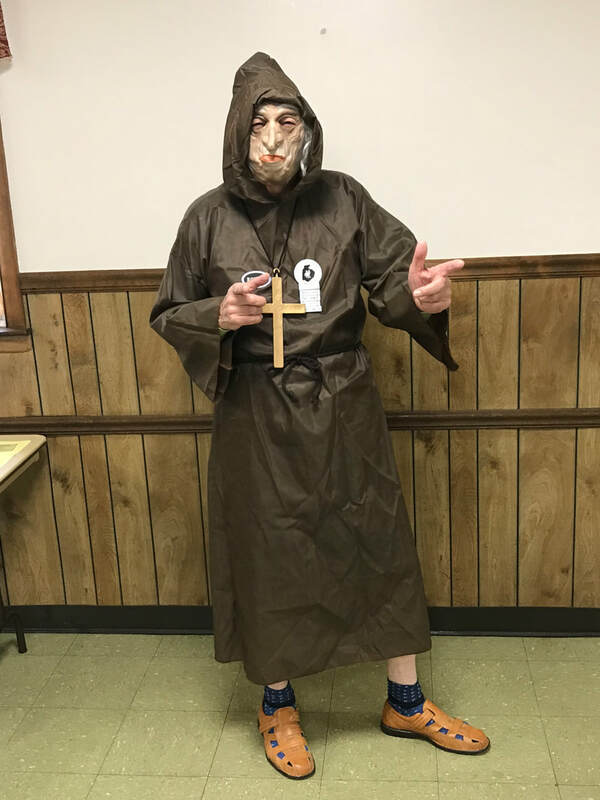 Club dance instructor Dan Grimes was in rare form calling his rendition of the Halloween favorite Monster Mash. Seven mainstream calls were taught. They are Roll Away, Touch A Quarter, Walk & Dodge, Partner Trade, Single Circulate, Single Hinge, and Trade By. The photo above on the left shows students and angels in square formation. The photo on the right shows the students, angels, and instructor (Dan "Scarface" Grimes) in their Halloween costumes. Two videos from the class are in the Video Gallery. 10/19/18 TOM THUMBS ROAD TRIP! 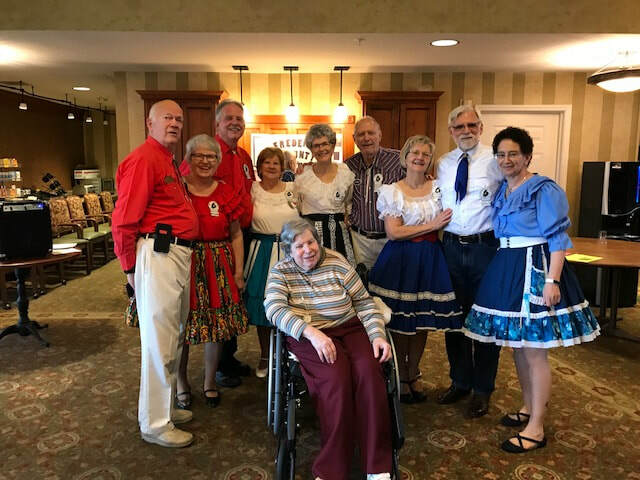 ​On Friday October 19th, twelve Promenaders, led by Club President Henry Lane, went "On The Road Again", ​eastbound on Route I-70, to the Tom Thumbs square dance in Ellicott City. It was the front end of a home and home trip. The Tom Thumbs will visit the Promenaders home turf in May 2019. 10/14/18 SPOOKY DISCO BALL DANCE! It was Spooky Sunday in Walkersville on 10/14 as the Promenaders hosted the Spooky Disco Ball dance. 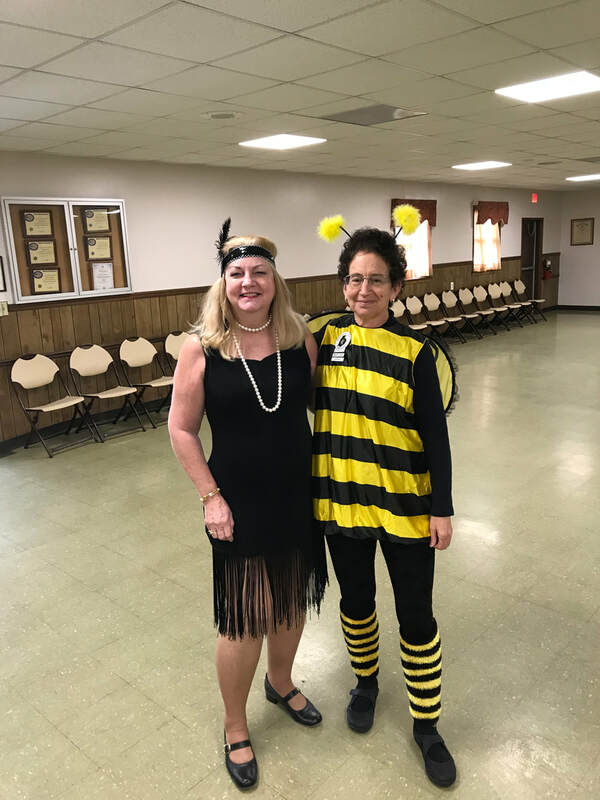 Pictured above from left to right are Robert Abdinoor as the Mad Monk, Club Caller Bruce Simpers as the Templar Knight, and Mary Tucker as a Roaring 20's Flapper Girl with Marjorie Barber as the Bumble Bee or a Retro Pittsburgh Steeler. 10/5/18 FALL BACK TO THE FABULOUS 50'S! 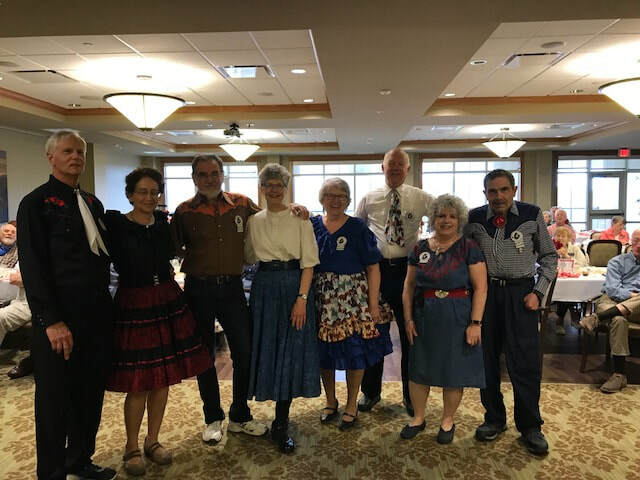 On October 5th, the FCP Square Dance Club went back to the Fabulous 50's when poodle skirts were in vogue and Elvis was the King. Mike McIntyre was the Guest Caller. The picture is the FCP Poodle Skirt Brigade in full regalia. An associated video is in the Video Gallery. 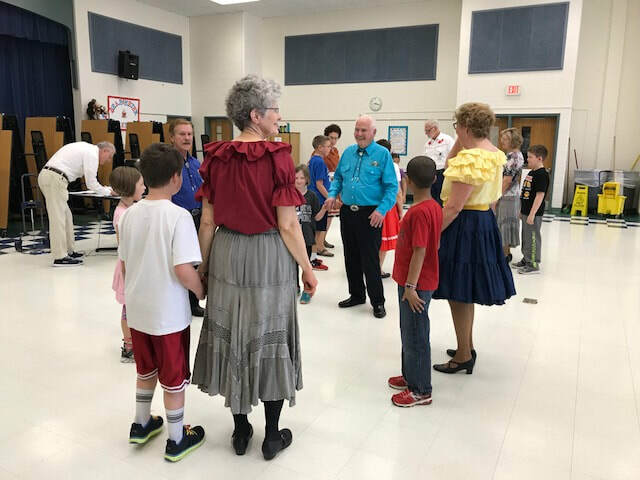 On September 26th, the FCP road team performed a square dancing demonstration at the Fahrney-Keedy Home & Village near Boonsboro Maryland. 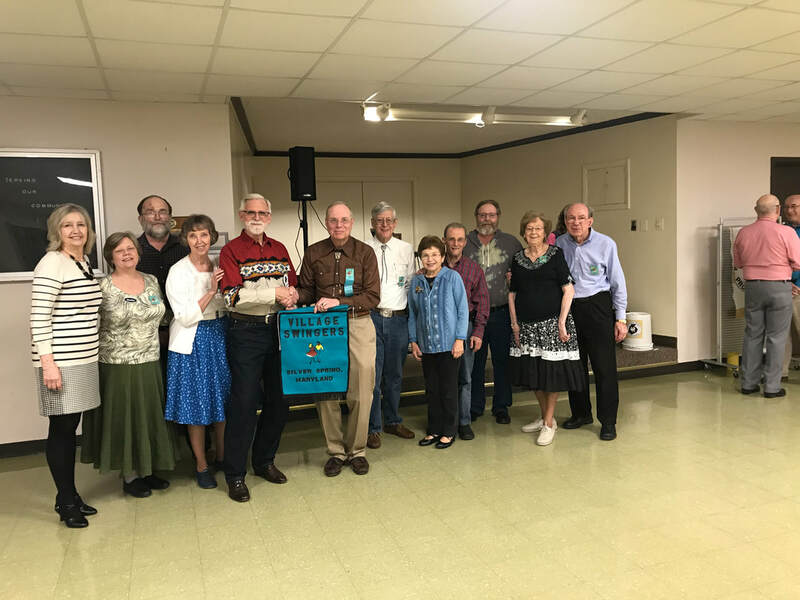 Pictured above from left to right are FCP club members Dan Grimes, Marjorie Barber, Robert Abdinoor, Beverly Magyar, Carl O'Dell, Mary Ann Gearinger, Jan Dommerich, Alex Dommerich, Suzanne Law, and Alice Bryant. 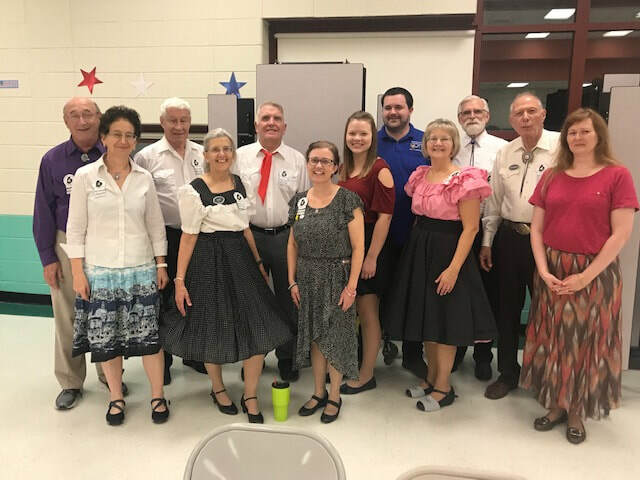 The Frederick County Promenaders Square Dance Club danced before the Rock and Roll Relics concert at Baker Park on Aug. 26. They then invited audience members to learn a few basic calls. Art LaVigne was the caller. Participating dancers were front row, from left: Ruby Shane, Sherry Downs, Cathy Ligsay, Beverly Magyar, Margie Barber, Karen Lane, Bonnie Pollack, Andrea Smith, Pam Harris, Faye Trageser, Peg Nutter, Amy LaVigne, and Mary Ann Gearinger. 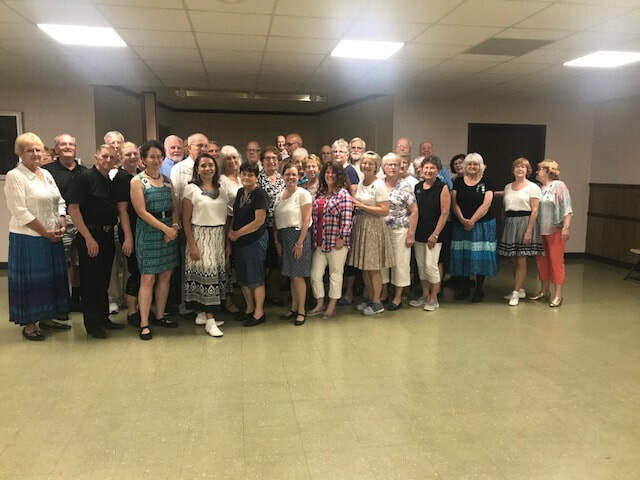 Back row: Jan Dommerich, Jerry Pollack, Barb Dodge, Kevin Sullivan, Art LaVigne, Andrew Provo, Henry Lane, Dan Grimes, and Robert Abdinoor, who coordinated the dance performance, which was the Promenaders’ fifth appearance before a Sunday concert in five years. Call 240-356-1255 if you are interested in square dance lessons or if you have questions about the Promenaders. ​ The news article appeared in the September 26th edition of the Frederick News Post. 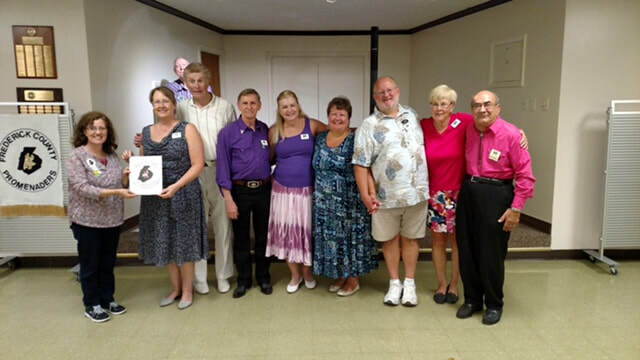 The last 2018 Summer Sizzle dance featured a celebration of the 50th wedding anniversary of Jan and Alex Dommerich (pictured on the left). Happy Anniversary Jan & Alex! The entire dancing crew is pictured on the right. Having survived the arduous and imposing "Rubber Band Square" final exam, the students received their graduation certificates. 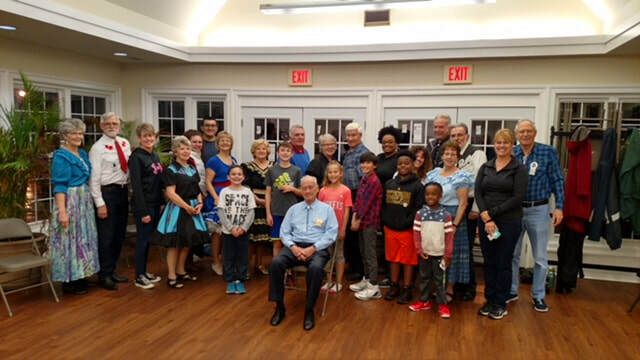 Pictured from left to right are Andrew Evans, Andrew Provo, Class Coordinator Andrea Smith, Brian Garlick, Barbara Dodge, Club Caller and Dance Instructor Dean Singleton, Regine Schwab, Craig Hougum, Trina Wagner, Chuck Wagner, and Class Coordinator Marjorie Barber. Not pictured is the picture taker and Class Registrar Donald Barber. Sometime during the Friday June 15th Summer Sizzle dance, the FCP banner was stolen. It just so happens that members of the Tom Thumb Square Dance Club (pictured above) were present for the dance. Afterwards, an enraged Club President and Commander-In-Chief Henry Lane was quoted as saying "this unprovoked banner steal will not go unpunished". He is already making secret plans for the Frederick County Promenaders Super Secret Covert Operations Team (FCPSSCOT) to travel to the thieves with itchy Thumbs lair in Ellicott City with orders to retrieve the prized possession by any means necessary. ​Things were not as casual as anticipated at the Summer Sizzle dance on Friday July 6th. The Four County Squares contingent had other ideas. They took strategic advantage of the "casualness" and managed to retrieve their banner previously stolen by the Promenaders on April 21st.. The devious retrieval was organized by Club President Don Pahl, pictured in the Black Hat. 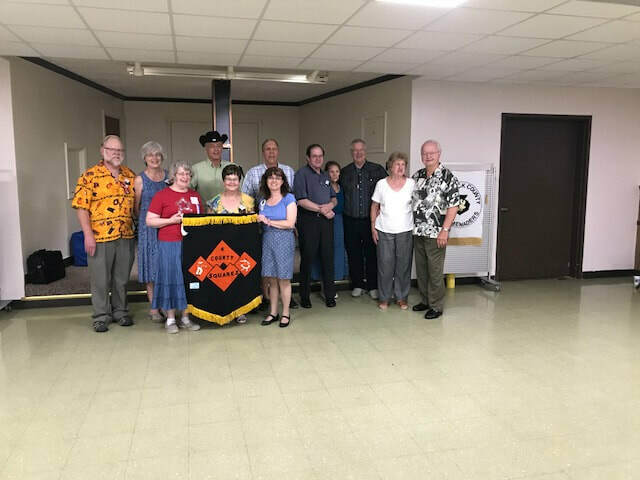 ​On Saturday June 2nd, a felonious contingent of FCP club members visited the Friendship Squares club dance, with the ultimate nefarious goal of retrieving the FCP club banner previously stolen from them. As you can see, the mission was a success with club member Andrea Smith capturing the FCP banner from Friendship Squares club member Jim Newell. To date, FCP banner retrieval teams have a 100% success rate. 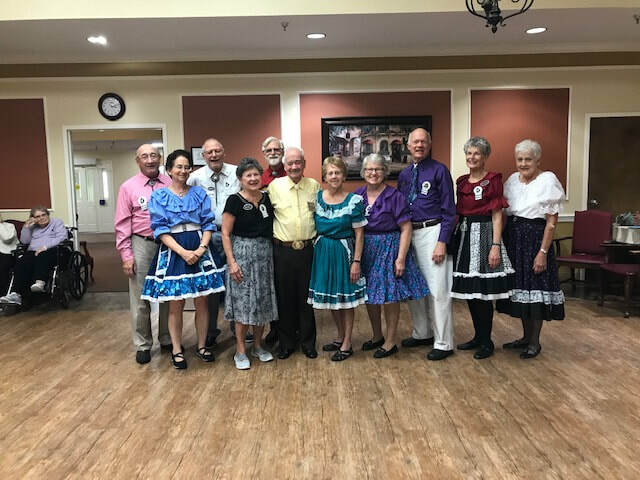 ​On Wednesday May 30th, FCP club members performed a square dancing demonstration at the Country Meadows of Frederick nursing home. Club members pictured standing from left to right are: Alex Dommerich, Jan Dommerich, Kevin Sullivan, Ruby Shane, Suzanne Law, Robert Abdinoor, Karen Lane, Club President Henry Lane, and Marjorie Barber. 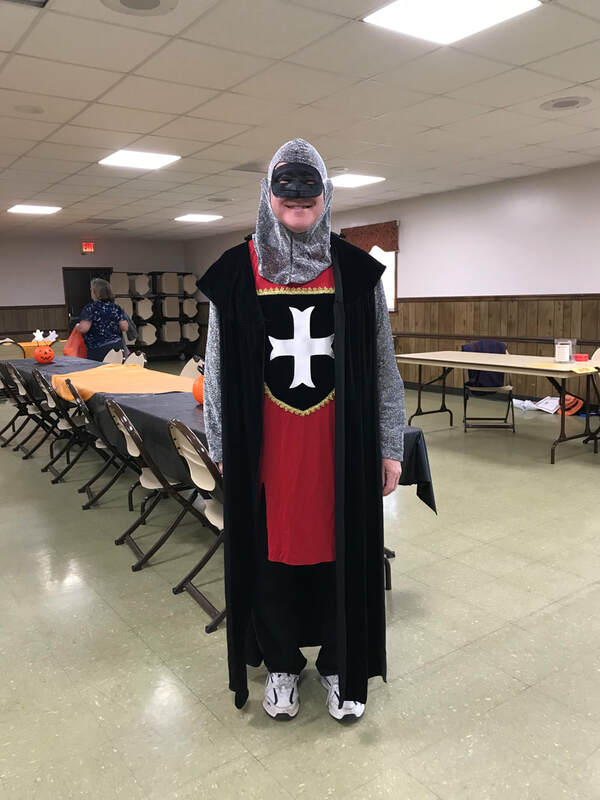 ​After going on the lam and laying low for a while, the Frederick County Promenaders Super Secret Covert Operations Team (FCPSSCOT) reappeared and brazenly heisted the banner from the Four County Squares Dance Club on Saturday night April 21st. 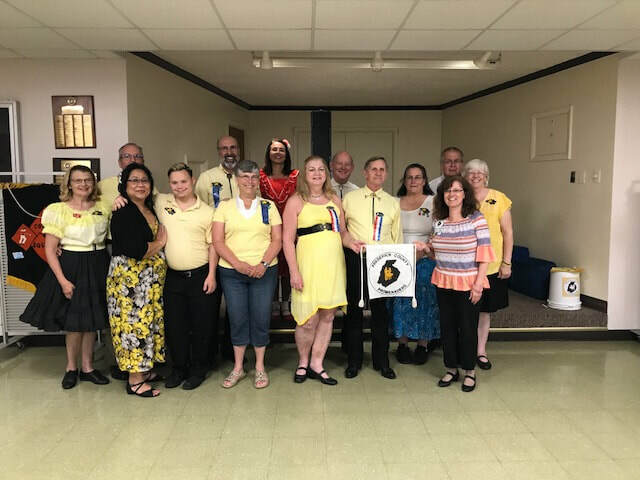 Pictured above are club members Andrew Provo (student), Jan and Alex Dommerich, Ellen and John Magnusen, Robert Abdinoor, Pamela Harris, Natalie Fogle, and Ruby Shane.Also in the picture is Four County Squares Club President Don Pahl (Black Hat). Not pictured above, but also included in the larceny were club members Brian Garlick (student), Linda Roberts (Club Cuer), and Dave Ludewig. 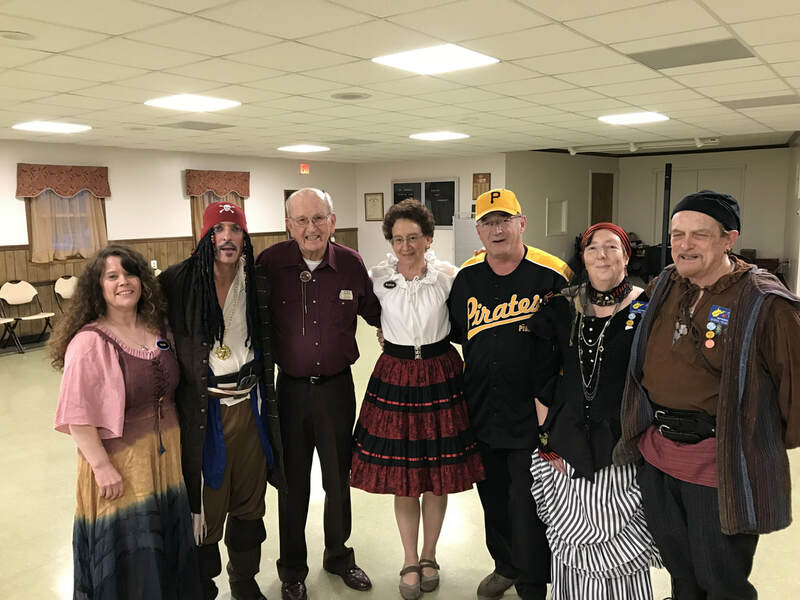 Above are 6 selected pictures from the Pirates on Parade dance from April 20th. ​P.S. Did anybody tell Scallywag Dan Grimes that he wore the wrong Pirate outfit. Maybe he thought it was the Sports Night dance? He should have walked the plank for that one. 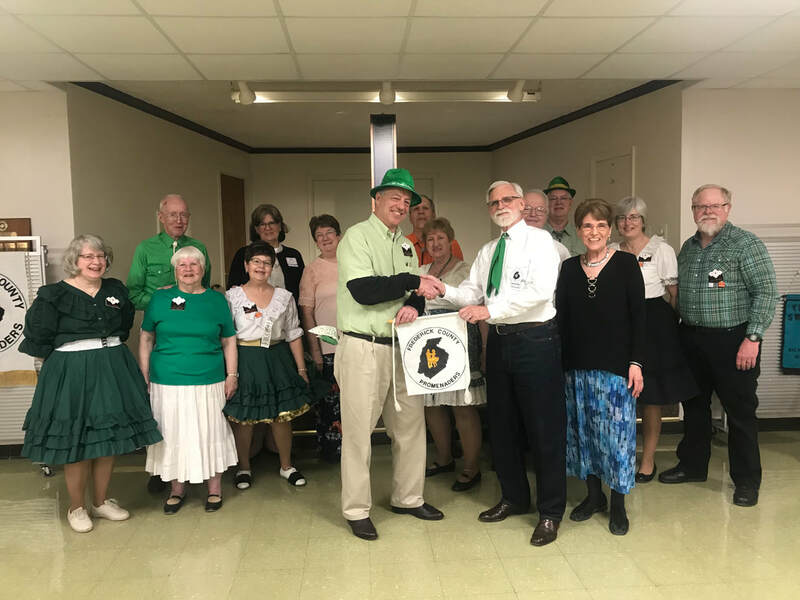 ​On April 17th, the Promenaders took a square on the road to the DayBreak Adult Services Inc in Frederick Maryland for a square dancing demonstration. Pictured above from left to right are Pat Marks, Marjorie Barber, Mary Ann Gearinger, Suzanne Law, Barbara Dodge, Jan Dommerich, Alex Dommerich, Bonnie Pollack, Robert Abdinoor, and Jerry Pollack. ​The FCP square dance touring revue continued on Wednesday April 25th at Homewood. This contingent from L to R is John Owens, Marjorie Barber, Jim Schneck, Suzanne Law, Jan Dommerich, Alex Dommerich, Bonnie Pollack, and Jerry Pollack. ​The former hippies, yippies, and student protesters of the 60's showed up in force at the Woodstock Revisited dance on February 17th. As of this posting there were no reports of sit-ins or war demonstrations at the dance. 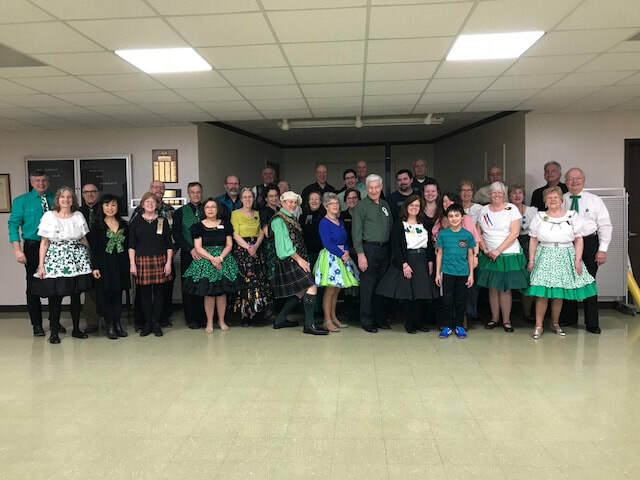 ​A sea of green at the Promenaders March 2nd Irish Ceili dance. ​On February 21st, members of the Promenaders went on a road trip to the Lovettesville Elementary School Aftercare center. During the demo the students were asked to participate. The picture on the left shows a student fixing a shoelace technical glitch before the "Show Could Go On". ​A sea of red at the Promenaders February 2nd Valentines Dance. ​Chalk up another successful banner steal by the now infamous Frederick County Promenaders Super Secret Covert Operations Team (FCPSSCOT). 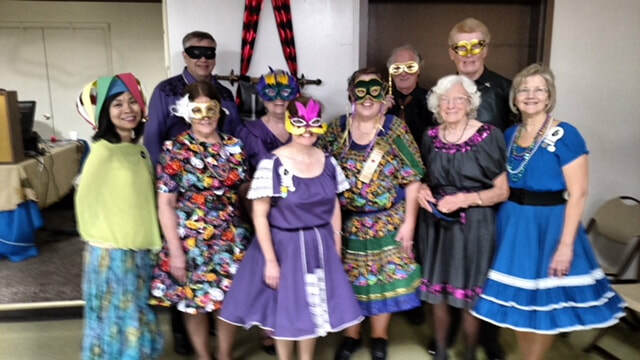 The team, minus Club President and team General Henry Lane, boldly heisted the banner from the Panhandlers Square Dance Club on Saturday night February 3rd using a visitation as the guise to enter the clubs domain. Notably absent from the heist was Henry Lane, who trusted that the mission would be ably carried out in his absence. Could the mastermind General be laying low until the heat is off? Only time will tell. 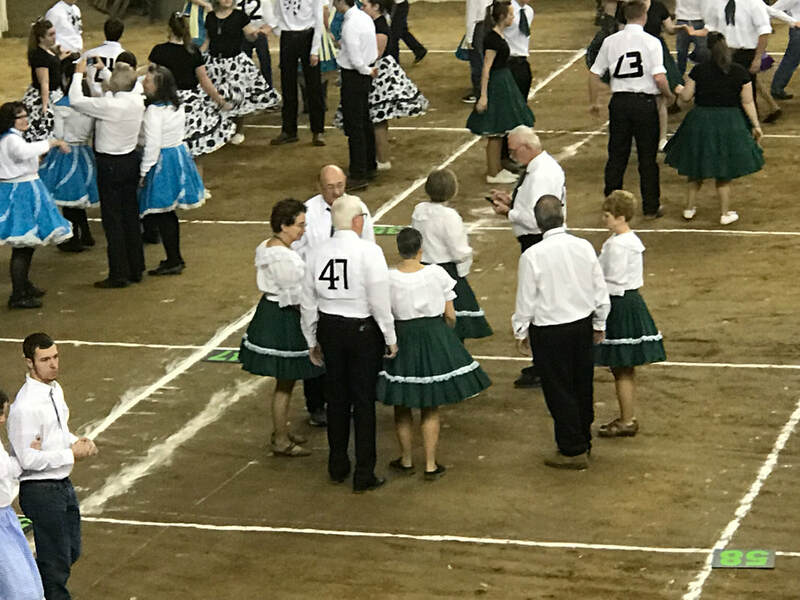 On January 8th, FCP Club Members Marjorie Barber and Dan Grimes, who are also members of the Gad-Abouts, were part of the Gad-Abouts Square Dance Clubs contingent that performed in square dance exhibition and competition at the Pennsylvania Farm Show in Harrisburg. A total of 60 squares participated in the event. The picture shows the Gad-Abouts members displaying their Superior Performance Blue Ribbons! 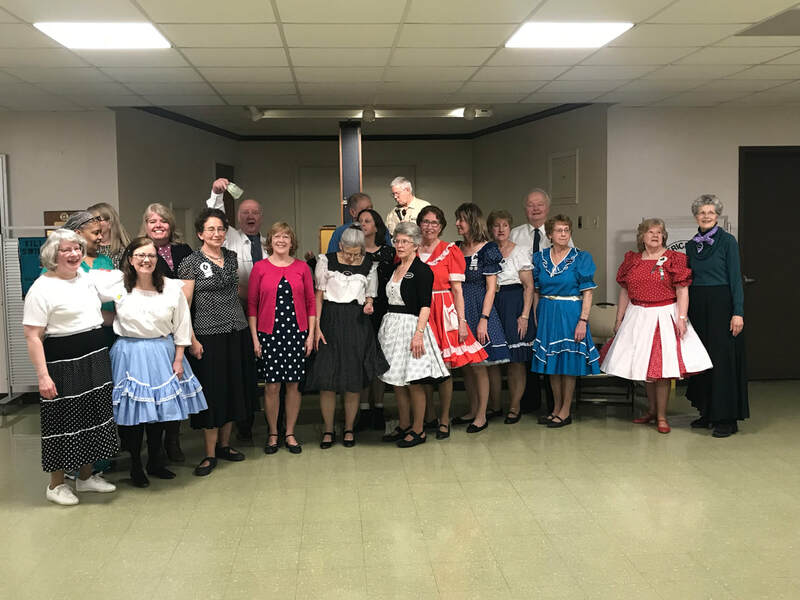 ​On Saturday December 9th, members of the Promenaders, pictured above, performed 2 square dancing demonstrations at the DL George & Sons Company Christmas party in Hagerstown Maryland. 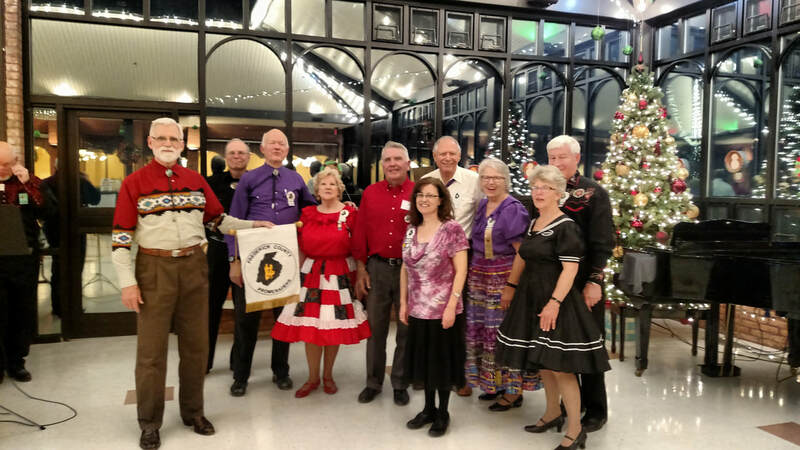 ​On Saturday December 2nd, the Frederick County Promenaders Super Secret Covert Operations Team (FCPSSCOT), led by their Team General, retrieved the previously heisted FCP banner, during a visitation to the Village Swingers Square Dance Club in Rockville, Maryland. The FCPSSCOT was last seen hurtling up the I-270 car-pool lane towards Frederick with the Montgomery Count Police in hot pursuit. The cannot be named for obvious security reasons FCP Club President and Team General is seen in the photo holding the FCP banner. ​The costumed characters from the recent Halloween Glo-Stick dance. Who is that Al Capone look-a-like chap (2nd on the left) and what is that object he is holding? Aah, that's Gangsta Dan Grimes with his water toting machine gun! Also, who is that gal to the left of him in the Pittsburgh Steeler retro uniform? Why that's Marjorie "The Bee" Barber. Six of the eight 2017-2018 dance class students attended the Frosty Friday Potluck Dinner dance on 12/1. Pictured above from left to right are: Brian Garlich, Elaine Fitzpatrick, Bob Fitzpatrick, FROSTY, Regine Schwab, Andro Provo, and Andrew Evans. ​On 11/18, marching to the military style orders of FCP Club President Henry Lane, the Frederick County Promanaders Super Secret Covert Operations Team (FCPSSCOT), silently slipped down to Martinsburg West Virginia to retrieve their club banner that had been previously heisted by the Panhandlers on a recent visit to an FCP square dance. Pictured above are the elusive members of the FCPSSCOT holding the prized FCP banner. The FCPSSCOT returned to Frederick under the cover of night and await their next mission! P.S. The names of the FCPSSCOT members cannot be disclosed for obvious reasons. ​On Saturday November 4th, members of the Promenaders went on a short road trip to the Dearbought Community in Frederick MD. The purpose of this visit was twofold. The first part was a demonstration square dance for the members of the community. The second part was a First Nighter which allowed the members of the community to square dance with the Promenaders. The picture above includes Promenaders and community members. 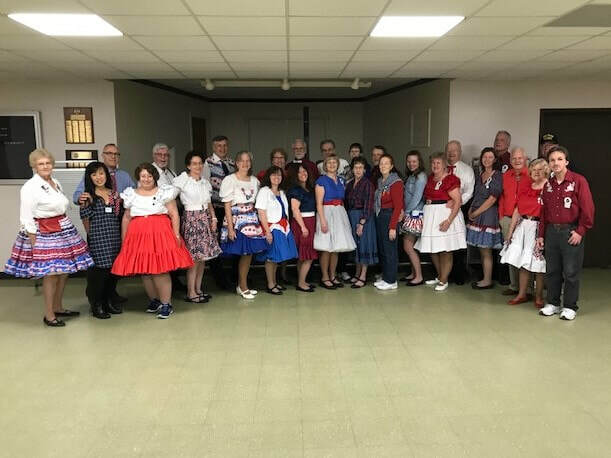 Members of the Promenaders Square Dance Club pose at the Salute To The Veterans Dance on November 3rd, 2017. 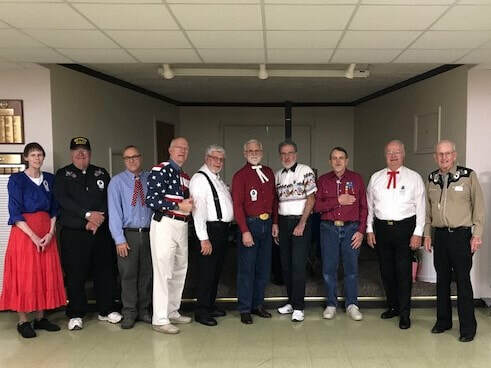 The photo on the right contains the Veterans who attended the dance. We all thank them for their service to our country! ​Members of the Promenaders sport their Venetian Carnival apparel during the clubs dance on October 6th. ​On Wednesday August 30th, after weeks of meticulous planning, eight members of the Promenaders went on a clandestine road trip to the Gerrymanders Square Dance Club headquarters in Chevy Chase Maryland to steal their beloved banner. For their efforts they were given a token piece of paper. Why, do you ask? Well, it seems that the Gerrymanders banner had previously been stolen. Or, could it be that the Gerrymanders knew of the Promenaders sneaky ploy and hid their banner. In either case, the Promenaders surreptitious soiree resulted in a mere piece of paper. Promenaders Club President Henry Lane, when told of the failed attempt, promised a full investigation of the circumstances surrounding the event. Pictured above are the eight smiling members of the Promenaders receiving the piece of paper. 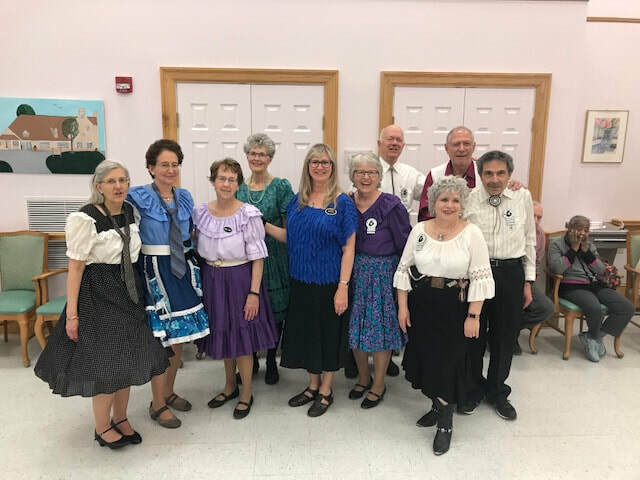 ​Pictured above are the members of the Gad-Abouts Square Dance Club who visited the Frederick County Promenaders square dance on August 18th for the sneaky purpose of retrieving their badge which had been previously stolen by the Promenaders in a prior visitation to a Gad-Abouts square dance. It is believed that the "under-the-radar" retrieval was an "inside job" since two of the Gad-Abouts are also members of the Promenaders square dance club. I cannot positively identify the plotters but do not let the innocent smiles of Gad-Abouts Club President Dan Grimes (back row 2nd from left) or FCP member Marjorie Barber (front row 3rd from left) fool you. 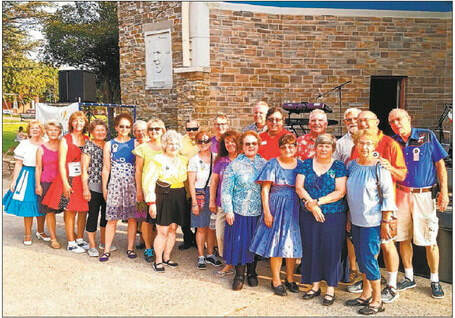 ​On August 18th, the Promenaders banner was stolen during a visitation by the Friendship Squares Square Dance Club from Linthicum Maryland. This larcenous event occurred on the same night as the Gad-Abouts retrieval of their previously stolen badge. The above picture of the members of the Friendship Squares reveals the red hot banner in their possession. Promenaders Club President Henry Lane vows to review security procedures at the Mt. Pleasant Ruritan Club to prevent this type of double event from happening again. 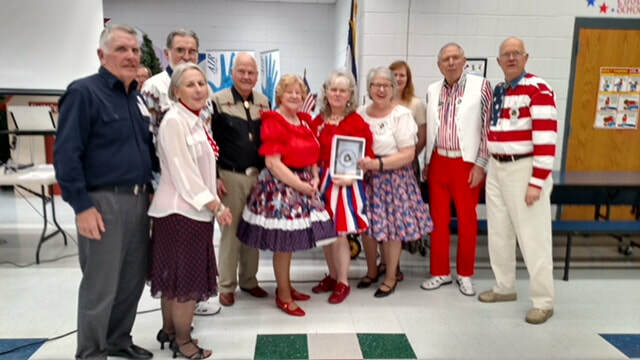 ​During their August 4th visitation to the Promenaders square dance, members of the Panhandlers Square Dance Club of Martinsburg WVA, "heisted" the Promenaders banner. Pictured above is Club President Henry Lane handing over the banner to the strong armed Panhandlers. Henry was later quoted as saying "They'll never get away with this". A visit to reclaim their stolen booty is now being planned. ​Here we go again! 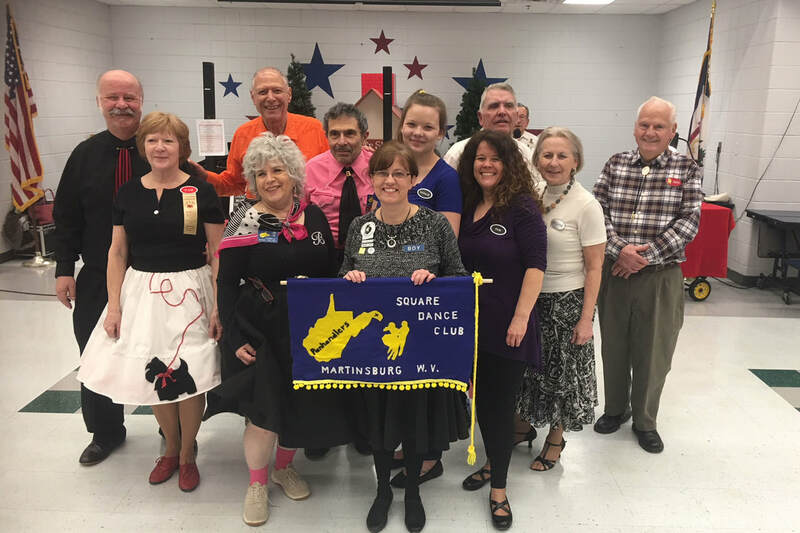 The Frederick County Promenaders club banner must be a rare and valuable item as it was once again stolen during the June 16th Summer Sizzler square dance. This time the larcenous looters with itchy Thumbs were members of the Tom Thumb Square Dance Club from Ellicott City Maryland. To add insult to injury, the Tom Thumbers were last seen "Thumbing their noses" as they left the building with the banner. FCP Club President Henry Lane, after Thumbing through the Frederick County Legal Code for theft violations, was quoted as saying "those rascals will not get away with this".